Huge crowds are once again expected to attend the annual “Pumpkinfest” at Castle Ward, near Stranmgford, Co Down on Saturday 13 and Sunday 14 October. Ruth Teijido, Castle Ward Visitors’ Services, said: “We have an amazing 3,000 pumpkins to choose from! You can scoop out the inside and draw your pumpkin design before taking your pumpkin to our expert carvers who will complete the finished look. And you can go back in time with a nostalgic Horse and Carriage ride (weather permitting) to the big house which will free to enter on the day. There you can join the “Mystery in the Mansion” and Meet the scary Wizard in the basement. Then join the Pumpkin People Trail on the front lawn and meet some legendary Castle Ward Pumpkin People on your way to the Farmyard. 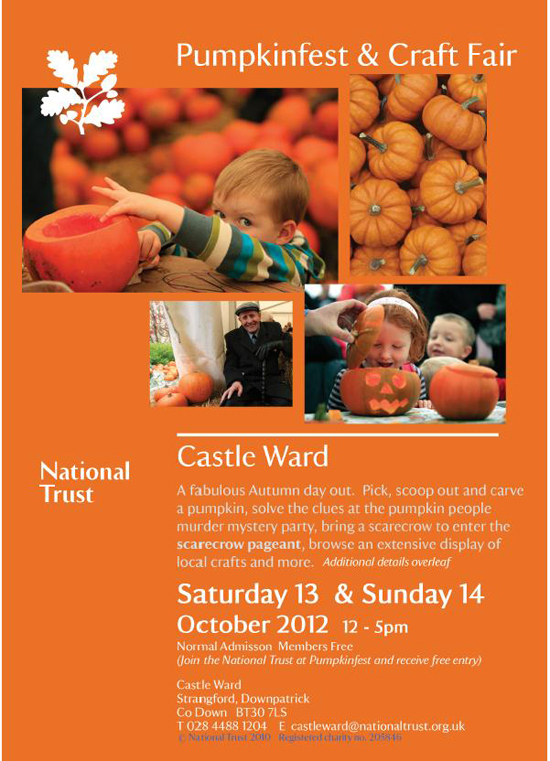 Visit Castle ward and enjoy the magic of the Pumpkinfest. “But don’t forget to create your own fabulous and unusual scarecrow in our exciting Scarecrow Competition. Bring it along to be judged at Castle Ward’s Scarecrow Pageant, drop your scarecrow off facing the pumpkin marquee between 10am and 3pm and prizes will be awarded each day to the under 12’s and over 12’s to adult. Your scarecrow can be big, small, elegant, themed or traditional, all types are welcome! “The Farmyard will be buzzing with activity at Phil’s Mobile Farm beside the Barn; Fifi the micro pig, Levi the llama and Skippy the wallaby are just a few of the friendly animals you may meet. There will be a great display of local crafts beside the Stableyard and a fabulous new Craft Village with demonstrations in the Farmyard. Live music from “Sounds of the Clutch” (Saturday) and the “Silver Fish Band” (Sunday) will complete the wonderful atmosphere. 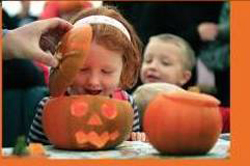 Pumpkinfest runs from 12pm until 5pm on Saturday 13 and Sunday 14 October. Normal admission charges apply. National Trust Members are FREE. If you JOIN the National Trust during this event you will receive free entry. Please ask for details at the admission point. For further information please contact Castle Ward on 028 4488 1204.